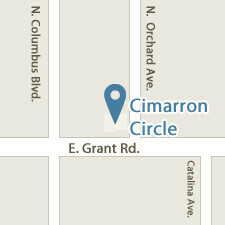 Cimarron Circle has been designing and building pools and spas for 40 years in Tucson, Arizona. We have won a number of awards for our excellence in design. Our customer-focused process is what continually fuels our reputation of quality and where we attribute our success. Cimarron Circle specializes in custom pools, spas, landscaping, outdoor living (such as ramadas and kitchens), water features and service. We take pride in every project that we complete, from large custom pools with cascading waterfalls to modest yet high quality basic residential pools. The decision to build a pool is critical for your needs, environment and budget. It will provide your home with additional value and enrich your life. We intend to give it the attention and dedication worthy of that call. Not every pool or spa needs to win an award or be labeled as the most creative on the block. These residential pool options are for home owners looking for a basic, yet high quality pool to add value and function to their backyard. Where we can offer more modest features, our standard pool options remain the best quality in Tucson and we stand by our reputation. If you are considering building a pool in your backyard, please give us a call today! What better way to minimize the barrier between you and nature than a negative edge or infinity edge pool? Energizing you as the sun rises, and relaxing as it sets, the view doesn’t get any better. These pools are at once harmonious and unique in style. Our pool builders would love to share with you interesting ways in which your pool plans can incorporate this beautiful feature. Natural rock and negative edge pools can be combined to create a wonderful look.